Great! It looks like serious work and I am sure lots of people (me among others) would love to have one of those nearby their sofas when they come back home . What about integration with smartphones? “Purity of Essence” and “Peace On Earth” from the movie “Dr. Strangelove”. Have you ever seen a Russian drink water? They are out to sap our precious bodily fluids! Eh, why. install misterhouse on a free pc for your central processor and make these talk via RS232 back to the server and call it done. RS232? he probably already has his house wired for Ethernet…hence the whole PoE thing. Why would he run RS232 thru the walls now ?? Agreed. RS232 is so pre-1990. The build quality of the console is very impressive. If I wanted to have one of these mounted in a wall, I’d probably want to run the power from a reasonable distance away, and that would mean using something higher voltage than 5V or 3.3V. This is exactly why PoE is 48V. And if I wanted to (eventually, hopefully) have more than just a couple of these, I’d need some kind of RS232 hub – having an ethernet switch serves that purpose. So I went with PoE. Then again, it’s possible I just wanted to be able to ping an AVR. :) Also, I’ve been looking at using the xPL support in MisterHouse, but for now, I’m just using my cobbled-together Java code. You´re reading hackaday and still question him why he does it? I disagree. His alternative was interesting to consider, as were the resulting replies. This rivals some early commercial builds I have installed. Scott has taken homehacked automation a notch up by what he’s combined. Yes, it’s not a production ready revision. But- the direction he’s going by using a COTS display and POE makes this worth careful study. With an interesting expansion- A slight bit of Hackery on oh- WRT54 etc level wireless routers might make this detachable from the hardwired backbone. Power only being needed at that point. That’s because there are a LOT of places we sit in the house that may not have backbone hardwired to them, but that do have power. I’ve actually consider doing something with a wifi module like the RN-131C, and powering it from the AC line. It gets pretty expensive pretty fast, but you could even do something with WPS to get it authenticated on a secure wireless network. 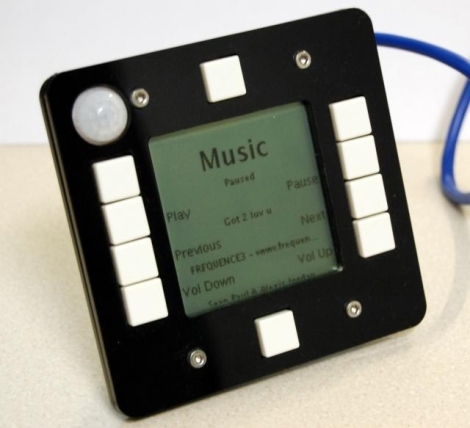 If I do something like this, it’ll probably be a remote-control for a dimmable florescent ballast or something. My problem is that I’m in a rented apartment, so I can’t run cat5 cable everywhere I want it. Forgive me if I didn’t see it on the article itself, but is Scott using proper PoE, or a home-rolled solution? The circuit kind of looks like he’s regulating down the +48v, but I could be wrong. Could you plug this into an number of cheap, old, Cisco PoE switchs (for example) and have it operate? In my case, I’m actually using a Linksys SRW224P i got from ebay, but any standard-compliant switch should work. Be aware that is some non-802.3af equipment out there – Cisco used to have their own PoE standard from before 2003. PoE is both a CONCEPT and a SET of often incompatible “STANDARDS” that were never properly coordinated. In a ideal world, designers would craft such things so the worst-case event is simple does not operate. In the arena of Hackerdom- we’re our own oversight. Designing PoE with a mindset of never knowing what will plug into it or what it will be plugged into is a Very Good Idea. That lowers the risk of very sad smoke releases. ANYTHING past the crudest prototypes we build “should” have a reverse polarity crowbar diode across it’s dc input plus MOV’s to clamp surges. How much is the cost difference for those parts Vs a total project loss? Add in the risk to connected gear getting smoked by a power event? “Be careful, but not too Careful” has exceptions where device or human safety risks warrant such consideration. Not yet. I need a vacation from my real job(s), so I can find more time to play with this stuff. I saw him at MiniMakerFaire Atlanta, enjoyed talking with him about the project for a couple minutes. I’m glad to see his projects on HaD. I’m prototyping something similar using bluetooth and an Arduino although if suitable 5″-7″ Android tablets start turning up under $100 – I’ll be considering them even if I do prefer buttons.